Such a debugging of Integrated Planning’s planning function can be invoked by classic ABAP statement BREAK-POINT. You can easily put it into your ABAP formula of your planning function. Such a debugging is based on classical external debugging which can be switched on TA SE38. 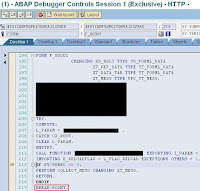 Some other SAP specialties concerning debugging can be found here.